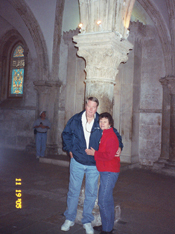 Our Christian Holy Land (Israel) tours are led by Rev. Ricky Anderson, owner of Holy Land Treasures. We invite you to come on the trip of a lifetime, a tour of the land of the Bible. Open to all Christian denominations, Ricky does all that he can do to make your tour the best 10 days of your life. For an application you may email us (be sure to write the reason for your email) or call us toll free @ 1-866-416-4659 (9 to 9 Eastern). Your price includes all taxes, round trip airfare to Israel from New York, motor coach for the duration of our tour, 3 to 5 star hotels (price based on double occupancy) and breakfast and dinner daily. Our Holy Land tour price does not include optional trip insurance ($209.00), single room supplement ($500.00), tips (Approx $125.00) and lunches. Our Holy Land tour will be a Christian tour, not a trip for the secular historian. If you love the Lord and love and believe the Bible, your 10 days in Israel will be just like a child at Disneyworld. I have to warn you, I am not dry, I love to laugh and I love to have fun. There are times on our tour that we will be very serious and other times we will laugh so hard our sides hurt. I am a Bible believing Christian, every word of it, but I do not pick silly Christian fights. It is my prayer that everyone on our tour of the Holy Land will have the best 10 days of their life. Nearly every person that goes on their first trip to Israel is scared to death, thinking that once they arrive danger looms at every turn. I hate to dissapoint anyone, but the only danger that I have seen in any of my Holy Land trips is the 10 pounds or so that you may gain on all of the buffets! It is so ridiculously safe that once you are there a couple of days you will laugh at the thought that your Holy Land tour was going to be dangerous. If it were not safe I would not go. It is SAFE, SAFE, SAFE! It is easy to connect with the rest of your Holy Land tour group when we meet in New York. We usually fly United out of Newark and book our domestic flights from across the US with United as well. You won't even have to switch terminals, just walk to another gate. There is a food court next to United's international gate to Israel where the entire tour group will meet before boarding. I will have everyones flight info and your cell phone #'s. If you need me to I will come find you, I will not leave you. This is a Christian tour of the Holy Land (Israel). We will walk where Jesus walked and see things as He saw them when he walked this earth in an earthly body. A Christian trip to Israel will change your life, you will never be the same. Your Bible will come to life around you and you will go back to Israel every day in your mind for the rest of your life. Every group that I have ever taken feels like family for the rest of their lives after a tour, having shared together a special unique time with the Lord. If you long in your heart to take a Christian Holy Land tour, you will say that this is some of the best money that you have ever spent. Our Christian Holy Land tours are booked through Journeys Unlimited of New York and our dear friend and travel agent Ray Masillo.